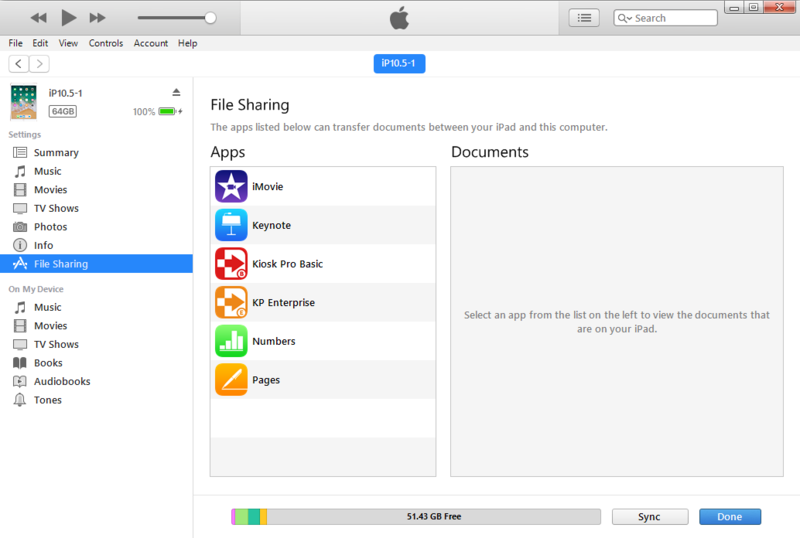 Our Basic, Plus and Enterprise versions let you store files locally on the iPad. This allows you to show off your content without having to worry about remaining constantly tethered to an internet connection. 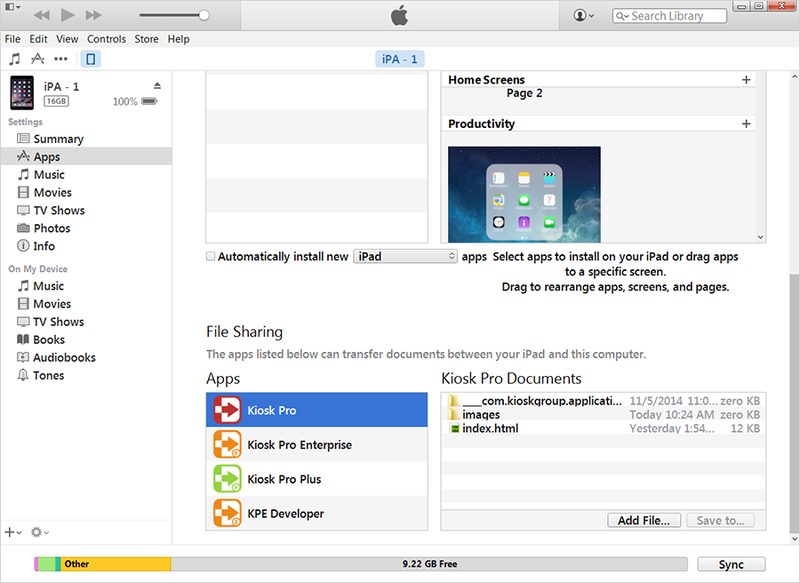 To view local files on the iPad through Kiosk Pro, you must transfer your files to Kiosk Pro's folder on the iPad - either by directly syncing the iPad with a desktop computer or, if you are using our Plus or Enterprise versions, by remotely syncing with a server or Dropbox. 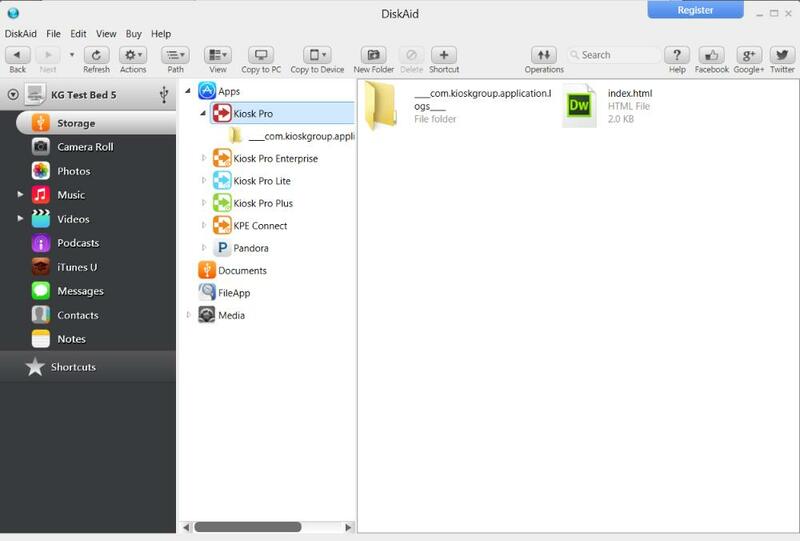 Apps are "sandboxed" by Apple, which means that an app can only access files stored in its own folder - this is done for security purposes and also so that a problem with one app won't affect others running on the device, but means that Kiosk Pro can't open files located outside its own folder. Start by connecting your device to a computer and opening iTunes. Access your device by clicking the iPad/iPhone icon that appears at the top left of the screen. In the left sidebar that appears, click 'File Sharing' and click on the version of Kiosk Pro you are using. Click the 'Add File...' button to transfer individual files to the iPad. You can also drag files into this 'Kiosk Pro Documents' window. If your content includes a folder structure, you'll have to use the drag and drop method as there is no way to transfer an entire folder using the 'Add File' button. iTunes cannot unzip files so all files must be uncompressed prior to transfer. Disconnect the iPad and type the filename into the Homepage setting for Kiosk Pro. If a file is in the Kiosk Pro Documents folder, that file can be accessed within the app without any additional file path. For example, if you stored a file 'index.html' directly in the Kiosk Pro Documents folder and wanted to set that file as the app's Homepage, then in Kiosk Pro settings you would set 'Homepage: index.html'. To delete files, highlight the files you wish to delete and hit the 'Delete' key on your keyboard. To download files from the iPad to your computer, select the files you wish to download and click 'Save to...'. Access your device by clicking the iPad/iPhone button that appears at the top left of the screen. 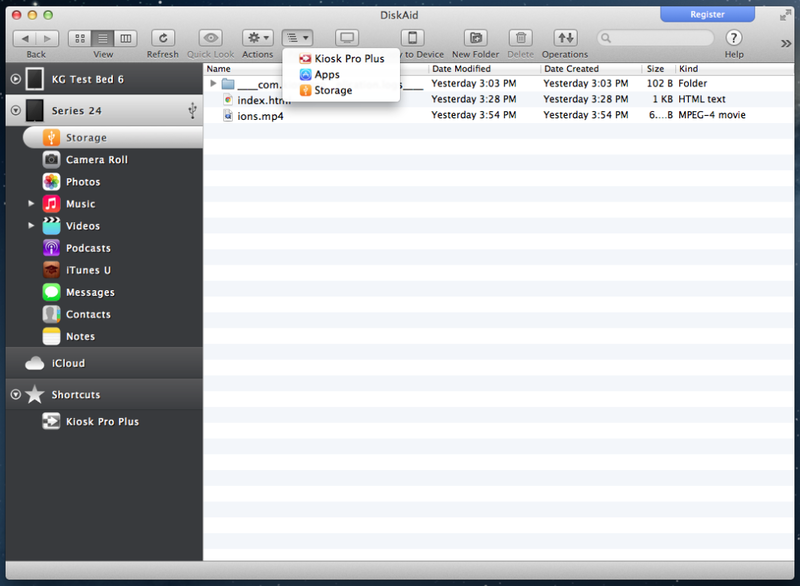 Scroll down in the main panelto 'File Sharing' and click on the version of Kiosk Pro you are using. Download and install iMazing. Click the blue 'Download' button, then double-click the .exe to install. Connect your iPad to the computer and open iMazing. On the bottom of the iMazing application, click the icon labeled Apps. Click on the version of Kiosk Pro you are using. This is the main Kiosk Pro Documents folder; you should see a folder called '___com.kioskgroup.applicationlogs___' which is used occasionally for troubleshooting, but can otherwise be ignored. To add your files and folders, simply drag and drop them into the Kiosk Pro folder space on the right side of the iMazing window or click on the 'Copy to Device' icon at the top (when given the option, choose 'File' instead of 'Folder'. You will be able to move multiple files.) iMazing cannot unzip files so all files must be uncompressed prior to transfer. Finally, disconnect the iPad and type the filename into the Homepage setting for Kiosk Pro. If a file is in the Kiosk Pro Documents folder, that file can be accessed within the app without any additional file path. For example, if you stored a file 'index.html' directly in the Kiosk Pro Documents folder and wanted to set that file as the app's homepage, then in Kiosk Pro settings you would set 'Homepage: index.html'. To delete files, select the files you wish to delete and click the 'Delete' icon. To download files from the iPad, select the files you wish to download and either drag and drop them to your desktop or click the 'Copy to PC' icon. Download and install iMazing. Click the blue 'Download' button, then move the iMazing file to your 'Applications' folder to install. To add your files and folders, simply drag and drop them into the Kiosk Pro folder space on the right side of the iMazing window or click on the 'Copy to Device' icon at the top of the pane. iMazing cannot unzip files so all files must be uncompressed prior to transfer. To delete files, select the files you wish to delete and click the 'Delete from Device' icon. To download files from the iPad, select the files you wish to download and either drag and drop them to your desktop or click the 'Copy to Mac' icon.